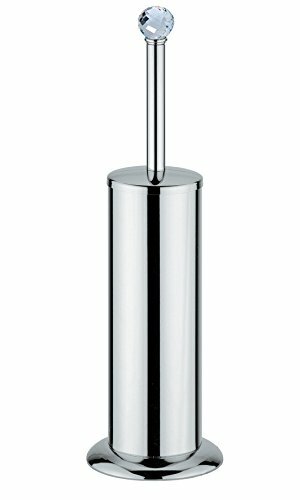 BA Folie Swarovski Toilet Brush Bowl & Holder Set - Brass Chrome. Created to bring everlasting beauty; this stylish Toilet Brush Bowl & Holder Set is designed to increase the level of elegance in your bathroom. - Manufactured in Italy. - Material: Brass, Swarovski Crystal. - Color: Polished Chrome or Polished Gold. - Type: Floor Standing. - Shape: Round. - Dimensions: 3.5 W x 3.5 D x 14.7 H in. Color: Polished Chrome or Polished Gold. Dimensions: 3.5 W 3.5 D 14.7 H in. If you have any questions about this product by BA Bath Collection, contact us by completing and submitting the form below. If you are looking for a specif part number, please include it with your message.